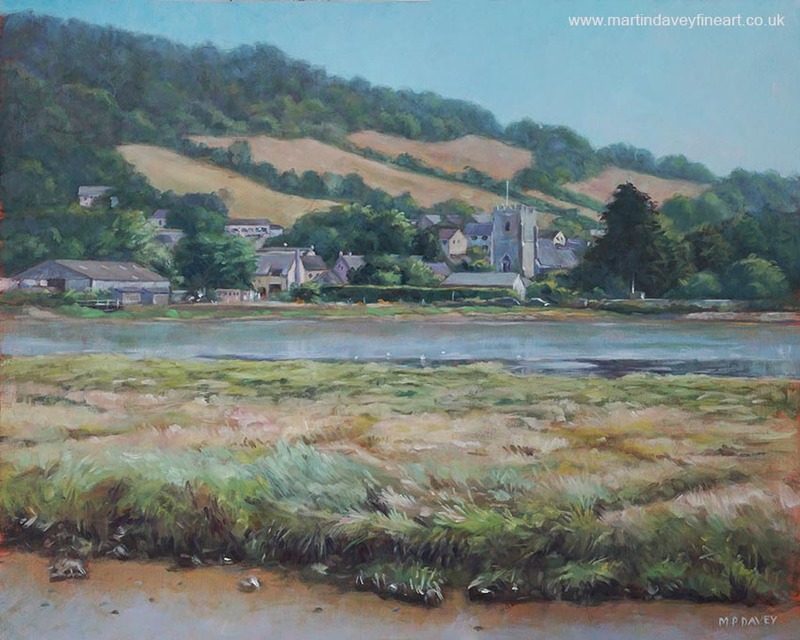 During late August 2018 this painting was created showing a pretty view of Axmouth, a village situated on the river Axe, and very near to the town of Seaton, in Devon, UK. The summer scene depicted in this painting is dominated by the 15th century church tower. The river is tidal as it is very close to the sea, and it can be seen that the mudflats are revealed with the tide being out. Apparently the remains of a late medieval fishing boat can be seen at low tide on the Axe estuary. The view is based on one from the tourist tramway which runs from Seaton up to Colyton, basically following the river, and using the old trackbed of the former railway. The painting is sized at 20” x 16” , and created on primed mounting board.